It's official! I am a delegate for Bernie Sanders to the 2016 Democratic National Convention in Philadelphia! Click this link to see the official announcement. Want to make a donation to help defray my expenses? Click this link to make a donation. I am told I won by a landslide and I am humbled by the honor of being a delegate. Please considering helping me pay for some of the costs of my attendance at the Democratic National Convention in Philadelphia this summer. I reckon it will cost me about $2000. I am asking for donations of any size to help defray my expenses. I promise to vote for Bernie, to advocate for Bernie's policies, to support other Bernie delegates, to resist oppression and unfair and/or anti-democratic practices, and to report news from the Convention on FB and Twitter! Thank you for thinking about it! I have set up a GoFundMe account. Click HERE to learn more about donating. I want to be a Bernie Sanders Delegate to the Democratic National Convention. There are three reasons to vote for me to represent Bernie Sanders voters. I am an activist for Bernie, I am a dedicated Democrat, and I am well-qualified to do the job. 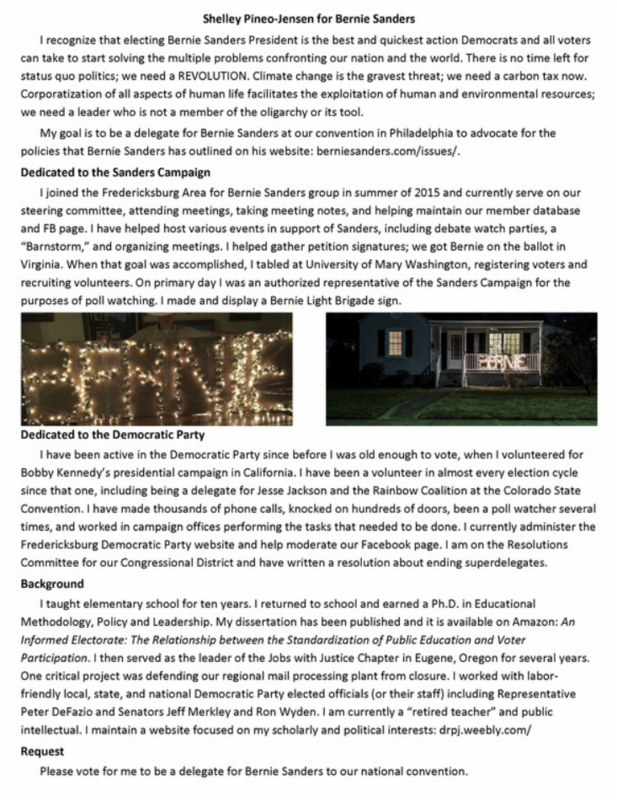 I joined the Steering Committee of Fredericksburg Area for Bernie Sanders last summer; we have hosted events, gathered petition signatures, and registered voters. I was an authorized representative of the Sanders Campaign at my polling place. I made a Bernie Light sign which is displayed in front of my house. Second, I am a lifelong Democrat. I worked for Bobby Kennedy’s presidential campaign in California before I was old enough to vote. I’ve volunteered in almost every election cycle since, making thousands of phone calls, knocking on hundreds of doors, and poll watching several times. I was a delegate for Jesse Jackson and the Rainbow Coalition at the Colorado State Convention. I administer the website for our Fredericksburg Democratic Committee. I was the president of my union when I was an elementary school teacher. I then earned a Ph.D. at UO. My dissertation is An Informed Electorate: The Relationship between the Standardization of Public Education and Voter Participation. I was the leader of a Jobs with Justice chapter were I helped organize thousands of members in support of local labor unions and saving our postal service. I recognize that electing Bernie Sanders is the best action Democrats and all voters can take to start solving the multiple problems confronting our nation and the world. There is no time left for status quo politics; we need a REVOLUTION. At our convention in Philadelphia I will advocate for the policies that Bernie has outlined. Please vote for me to be a delegate for Bernie Sanders to our national convention.